NORTH VANCOUVER, B.C. Parkside living is a popular preference as Qualex- Landmark™ group’s newest addition, Green of Queensbury, continues its demonstrated track record of sales success by selling out of homes in phase one and selling 95 per cent of homes in phase two for a combined value of more than $75 million in just one week. Following the success of phase one and two, phase three is set to be released soon. Green on Queensbury will break ground in October of this year and the project is expected to be completed by early 2020. 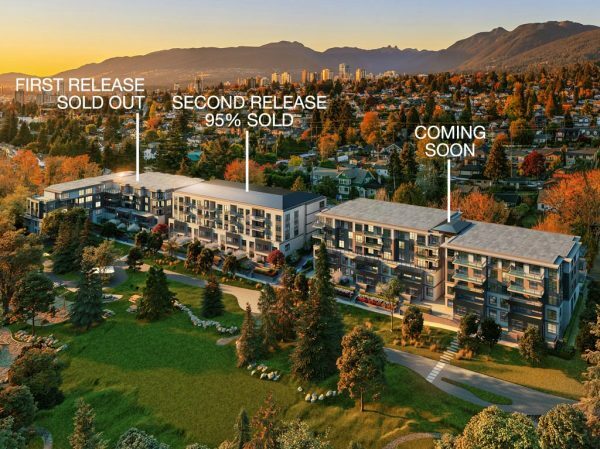 As North Vancouver’s first large scale and fully parkside residential community, Qualex-Landmark™ has contributed more than $5 million in development cost charges and community benefits contributions. Approximately $3-million will be allocated by the City to support the complete revitalization of Moodyville Park, significantly enhancing this natural element and lasting community benefit to the Moodyville neighbourhood and Green on Queensbury residents. Qualex-Landmark’s™ ability to design a rare mix of contemporary west coast architecture and natural beauty with exceptionally designed one, two and three bedroom condos and park-front townhomes has contributed greatly to this project’s success. Recent British Columbia housing sales trends align with Green on Queensbury’s popularity, as Greater Vancouver residential multiple listing sales have increased by 21.3 per cent from August 2016. Photo caption: Green on Queensbury residential community situation on the soon to be revitalized Moodyville Park. Homebuyers that registered are at the front of the line to choose their preferred home. Green on Queensbury may sell out all three buildings before opening to the general public, so homebuyers interested in the third and final building should register at: http://qualex.ca/green/ and schedule an appointment to visit the discovery centre at the corner of East 3rd Street and Queensbury Ave. in the City of North Vancouver. As the first fully park-side development in Moodyville, Green on Queensbury award-winning designers’ GBL Architects Inc., Cristina Oberti Interior Design Inc., and PFS Studio landscape architects have produced designs to appeal to young families, young professionals and empty nesters to maximize the advantages of living on Moodyville Park. The design is especially appealing to those seeking an outstanding living space with direct access to parkland and the North Shore Spirit Trail. For more information on Green on Queensbury visit http://qualex.ca/green/ to register. The Qualex-Landmark™ group have an extensive track record of both residential and commercial real estate success in the highly competitive Vancouver and Calgary markets. Qualex-Landmark™ group have built their success on their ability to innovate and their dedication to customer satisfaction. Previous projects in Calgary include STELLA, NOVA, LUNA, CALLA and MARK on 10th. ™ denotes one or more trade-marks of Qualex-Landmark Management Inc. used under license by Qualex-Landmark Union Inc.